This week’s show Let’s Ask the Angels on BlogTalk Radio is shortened to a half hour. I had some technical difficulties so was unable to take your listener calls! We’ll be back to normal on the next show with a full hour! 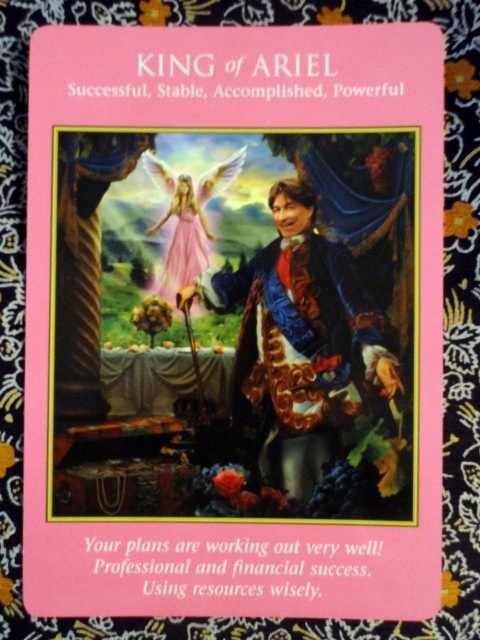 This week I was guided to use the ARCHANGEL POWER TAROT Cards by Doreen Virtue and Radleigh Valentine. These cards are all about empowerment and supporting you in your life. 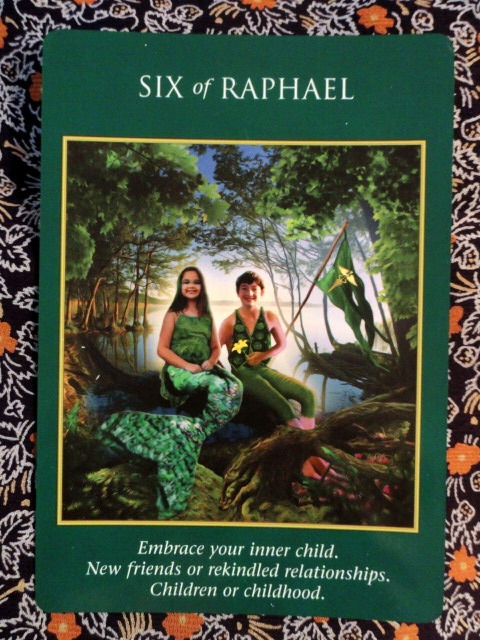 For the Monday and Tuesday of this week we have the SIX Of RAPHAEL: Embrace your inner child. New friends or rekindled relationships. Children or childhood. Pay attention to any new friends who have recently come into your life as they may be past life connections. Old friends may also reenter your life. Memories from childhood that are filled with positive powerful energies that you can tap into to create in your present life. There may be some you had forgotten and now they may emerge as a glimpse to hopes and dreams that truly source you. Psychically you are powerful as you embrace these highly creative ideas and passions you once had as a child coupled with meeting the perfect people to allow you to evolve and prosper. For Wednesday and Thursday we have the KING OF ARIEL: Successful, Stable, Accomplished, Powerful: Your plans are working out very well. Professional and financial success. Using resources wisely. There’s a lot of wonderful things going on right now with your different projects and career. You are aware of using your inner resources as well as your outer to create wisely. There may be an accomplished mentor or partner that enters your life at this time. You definitely are reaping the rewards of all your hard work. Congratulations! For Friday and the weekend we have the NINE OF RAPHAEL: Make a wish! Dreams become reality. A joyful time of life. This message continues the previous one of powerful creative energies. What have you been thinking of asking for? Now is the perfect time to go ahead and make that wish! It s a powerful manifesting time and your hopes and dreams become a reality. Worries fade, fears dissolve. Life is magical! Beauty and happiness are yours! 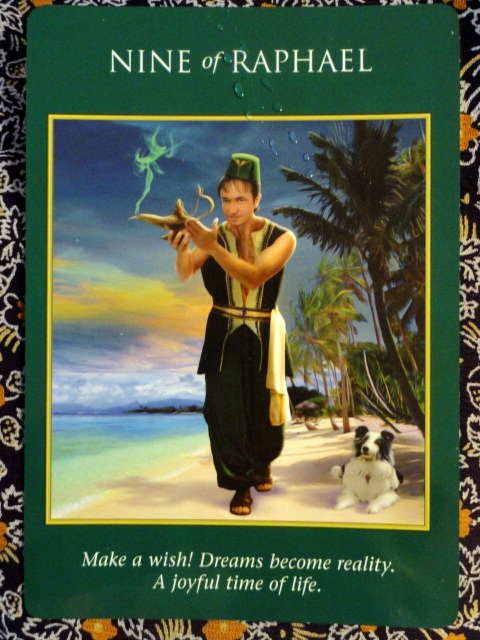 This message is acknowledging all the work and focused intentions you have made. There is contentment and joy in the simple pleasures of being alive! Overall it is a very positive and uplifting week of high psychic attunement, attracting the people and the abundance you have asked for to come into you life. Be present and enjoy! Allow the grace and ease to enter your life! Have a fabulous week! And Happy Halloween!